So, I have been playing since the beginning of Y!PP (with different pirates, and I stopped for a little bit, but you know what I mean) And a major problem in the favouritism from the OM?s Dev?s and rich people. Such as, Yesterday Adrielle created a contest to draw a leopard, (awesome contest) and Apollo joins. This is obviously not a problem because they are allowed to enter any contest. But, If i had of created a contest like this I?m 99.9% sure that Apollo or any of the OM?s wouldn?t have joined or participated in quite the same way. Maybe Apollo would have still joined if I created it, but he wouldn?t have played around with me like he does with Adrielle. Another thing, A while back I saw Nemesis on the dock, just standing there, Bertz (from Cobalt) goes over and talks to her and they have a conversation. Later I try and talk to her and I am absolutely ignored, but then another rich person (Briggsy) goes over and they start laughing and talking together, while I am standing there. Later on all the ?poor? people are standing around the docks while the rich people are having a blast with an OM. I felt like an outcast. This is not how the OM?s should act at all. Because if you want more people to stay in puzzle pirates you have to be friendly to them and act like they?re a part of your group. Just because they?re ?poor? doesn?t mean that they aren?t nice people or don?t fit in your clique. more resons: I don't know if this one is true or not, but Im pretty sure it is because the person that it happened to is rich, Cronus took all of this one guys poe and gave him a yellow monkey in return. Just out of the blue. I dont care if they took all my money for the next ten years, I would kill for a yellow monkey. But unfortunetly, I'm not rich/known so this will never happen to me. MORE: the OM's renamed Adrielle's ship free of charge because they thought it was funny, But would they think that it was funny if they did it to a greenie or a casualltie? I think not. Yeah, I'm sure players that can just whip 100m when they feel like are concerned whether a player is rolling in it or not. Why would you even post something so stupid? Why would you even post something so stupid? I hope you see the irony in calling me a hater when you've posted a thread bawwing because an OM didn't respond to you. I've always found the OMs to be polite and helpful when contacting them through the proper channels. While they may appear in public from time to time in game it doesn't mean they have the time to interact with players. Stop acting like a baby. When OMs are on duty, they are working on several oceans at the same time, and using a web interface that isn't on any ocean. It's very possible that the OM wasn't watching the chat when that tell went by, or was too busy addressing an issue another player needed solved. Generally the OMs answer if they have time, and don't if they don't. Don't take it personally, they're just trying to fit their job in between socializing. I actually understand your feelings here, in part. I believe you are completely wrong about the money portion. You will probably find that the yellow monkey incident was part of an auction. As for renamed ships, that sometimes occurs in conjunction with event running, and other special cases. Yes, special. Not blind favoritism special, but earned trust and good cause special. 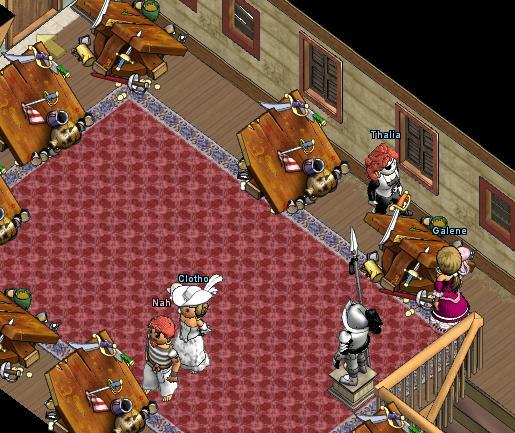 I understand feeling left out because when I first started playing this game, the forum events appeared to be a sort of private club, filled with the same names, over and over. As I persevered in joining whatever appealed to me anyway, though, I discovered two important things. One- I enjoyed making my entries, so if the "clique" didn't want me, so what? And two- there actually is no clique. The same names appear over and over because these are the people who enjoy participating. The more I joined, the more I found the other players to be welcoming and supportive. The same holds with OMs. They sometimes join in entering events and being part of jokes. Sometimes they can't or don't. It IS awesome when Apollo wanders in and doodles. That's because it doesn't happen every time, even for the regular event runners. A quick Search will show you that. So please, keep being one of the event maniacs. I think you'll find yourself liking it more, and feeling more a part of the fun, the more you do. I'm quite sure nobody has had any ships named free of charge. I can understand how you've reached certain conclusions, but they're still inaccurate conclusions. Unfortunately, a side effect of having interactive OMs is sometimes going to be that someone feels left out, and it's unfortunate that a series of events may have led to your perceptions. I doubt Nemesis deliberately ignored you, I am frequently multitasking and ignore people on a regular basis... A name she was familiar with may have caught her eye while yours didn't, for example. There are any number of other explanations. I suspect what caught his eye is the unusual event, not it's creator. Imp, totally sane mermaid-siren of Meridian. Thanks guys ;) not feeling so stupid now. Nice drawing by the way Apollo. You mean you actually go to talk to the OMs? I'm always trying my best to ignore them. They're always spamming my convos with lame jokes and pointless announcements about poker on Ice. Bunnyspawn, Malachite's most arrogant player. Also Bunnyspawn on Sage and Hunter;Disgraced on Viridian. Ditto this, except I had 300k once when I was throwing a flagiversary party and had a chunk of flag funds. A hug is like a strangle you haven't finished yet! I had an OM rename my ship because he thought it was funny. It was renamed a bunch of times while he was on it, to various goofy names to fit the situation when he was hopped onto my CI trip when it first went live. My favorite was Sinking Soon. It didn't STAY that way, of course, but it was fun while it lasted. I remember it, because I don't fit the definition of elite, rich OR favorite, and having an OM along...well, I wouldn't still remember the trip otherwise. I doubt the OM recalls it though. An OM came onto my war brig and I planked her. Yikes, I did the same for not asking to PTB. When one of our SOs pointed out that it was an OM, I made about 5 back-flips of apologies and explanations to get him back ... much to the amusement of everyone in /crew chat ... one does not anger the gods lightly ... and this OM came in response to a petition over something I promptly forgot. Okey as I have been mentioned by name in the original post I feel I must add a little. Minutes i would have totally agreed with what you was saying about the favoritism with certain pirates before that day you actually saw me. The only reason she spoke to me was because I was fortunate to have just won the first banana octo in the last sub boxs on the day of release (I know i was a lucky swine but i have always won total rubbish before like a sleeping hat) and to be honest I went to the DN docks to show it off....(come on who wouldn't have lol). Up until that point I had never spoken to an OM before or had they me (with the exception of petitions) so i think this proves actual wealth has nothing to do with it. I think it is simply the more you talk to them the more they recognise your name and respond as someone has previously mentioned in an earlier post or you have to be super lucky and win the latest colour fam lol. They haven't spoken to me since that day, no loss. A OM came on my Ship and he gave me a BJ? I know, iam famours and rich ...but still..
why is it you're so enamored by OMs in the first place? Their conversation is likely no more thrilling than a greenie you'd find on a dock, and behind the pirate is probably a bearded 30 something bored in the Three Rings Office. Nemesis is hating on me - she calls me a punk behind my back, then all my hearties laugh at me about it, because she took the liberty of telling a hearty of mine that! How awful! Nah, I love you Nemesis. Oh, by the way, try attending OM events, they can be a nice way to have a chat with them. I think I'm the clear favorite of the OMs. Sorry guys, get richer and maybe you'll have a chance. Nil used to play Mala. Nobody told me Clotho gave reach arounds.